Alan Wink, Director – Capital Markets at EisnerAmper LLP, assists clients with capital budgeting, capital structuring and capital sourcing. Alan has 20 years of financial and consulting experience, having served as Director of the Interfunctional Management Consulting Program at Rutgers Graduate School of Management, a program he helped build into one of the largest business school-based management consulting practices in the country. He started his career in accounting, spending six years on the audit staff of a Big 4 accounting firm and a Fortune 500 Company. Alan left the accounting field to expand his horizons in the area of Corporate Finance. Alan spent several years as Director of Financial Analysis for AmBase Corporation (NYSE), where he led approximately $2 billion of corporate acquisition activity. He is also a past Vice President of Capricorn Management, a $100 million private equity fund specializing in restructuring and turnaround opportunities. In addition, Alan is a leader in the firm’s Technology Group, providing a variety of industry-specific services to technology and life sciences firms, including business and strategic planning, marketing and competitive analyses, financing assistance, and operational and financial benchmarking. He has worked with many early stage and emerging growth companies on developing the appropriate capital structure for their position in the business life cycle. He maintains an active contact base with angel investors, venture capital funds and private equity funds. Alan also understands the level of returns private investors are trying to realize and devises strategies that allow both entrepreneurs and their investors to achieve desired return thresholds. For founders, angel investors and employees of most early-stage companies, dilution is a necessary evil. For a company to grow and thrive, it must be able to attract outside capital and talent – actions that most likely will require offering equity and diluting the ownership interests of prior investors and team members. The problem is even more serious for those early-stage companies that hit a rough patch in their development and must obtain much-needed investment through a highly dilutive down-round. 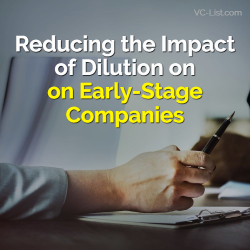 Because dilution can be a risk for angel investors and other financing sources, as well as potential employees, top management of early-stage companies often ask how they can minimize dilution. This is possible, albeit difficult. Founders should not be surprised if they have to give up between 10% and 30% of their equity to raise seed capital for a startup. While dilution can be constrained somewhat, as described below, it is important to keep the matter in perspective: Dilution is a normal consequence of a company’s evolution and a key ingredient for future growth and success. One effective means of reducing dilution is by financing growth through the issuance of convertible notes or other convertible debt. In such cases, the exchange ratio will be established and the convertible instrument will convert into equity only after the company has more of an operating history – typically when there is a Series A financing round. Relying on a convertible instrument postpones the inevitable dilution until it is possible to value the business more accurately by a third party – perhaps when the company has a working prototype of its product or service or a beta customer. It can actually be highly efficient to raise capital through a convertible instrument, since the entrepreneurs and investors do not have to wrangle over valuation until a later date. Another tactic that can be used to somewhat control dilution is to establish an option pool of equity early on, which the company can use to incentivize current and future employees. I have seen early stage companies set aside an option pool of 10% to 15% of their equity for such purposes and draw down equity from the pool as needed over time. While this may not reduce dilution in the absolute sense, defining the extent of the potential dilution up front does take a great deal of the uncertainty out of the process for founders, angel investors and early-stage employees. One measure that is not effective is the imposition of anti-dilution provisions in investor term sheets. Since the anti-dilution clauses tie the hands of the company in attracting future investors or other key employees in the future, they are not recommended. The best protection against dilution is for a company to exercise discipline in its deployment of capital, so that it will not need to go outside for significant financing. This will require having a well-defined business plan and strategy that anticipates how far a given round of financing will take the business. For example, what level of capital will be needed to get to a working prototype or to the beta phase with a key customer? Clearly delineating these benchmarks and executing the strategy in an efficient and cost-effective manner will increase the likelihood that future fundraising will be up-rounds. We are now seeing record levels of dry powder available for startups, with some recent estimates exceeding $121 billion at venture capital firms alone, according to Institutional Investor. At the same time, private equity firms are sitting on large pools of capital, which enables young companies to monetize their values by selling to a PE firm instead of through an IPO or other strategic acquirer. This supply (or, arguably, oversupply) of capital has increased valuations and, thus, has a somewhat dampening effect on dilution. As such, elevated valuations may not be sustained over the long term, and once more down-to-earth valuations become the norm it will be important to consider how best to minimize dilution while still supporting growth.